Full service casino, arena & event center offering table games, slots, live poker, food and entertainment. 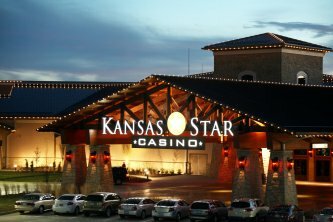 Located just south of Wichita in Mulvane, KS, The Kansas Star has over 1,770 slots plus bar-top video poker and a high limit slot room. For table players, there’s plenty to choose from with more than 60 table games including Craps, Roulette, Blackjack, plus an live poker room. Restaurants include the live-action Kitchen Buffet, An Pho – our authentic Asian Noodle bar, Tin Lizard Bar & Grill –With half-pound Certified Angus burgers, ice cold beers, and hand-crafted cocktails and enjoy live entertainment every Friday & Saturday night with no cover charge or come visit The Star Deli. The Star Deli is a great place to begin your day or just stop in for a treat. Choose from a variety of handmade deli sandwiches, grill items, and specialty baskets, all made with fresh ingredients. Check out the menus on the right! Combined with the excitement of a great gaming adventure, your business or social function will be a solid success in the Kansas Star Event Center! Whether you're holding a meeting or special event, our team of professionals will welcome you and help make it an event to remember! Our meeting rooms are ideal for a range of functions depending on the needs of your event. Our Ballroom offers over 11,000 square-feet of plush banquet and meeting space which can be divided into six distinct spaces. We also house an additional 42,000 square-feet of floor space inside the Kansas Star Arena along with three Executive Boardrooms. Our facilities are designed to accommodate an array of functions from the most intimate gathering to a sit-down dinner for up to 700 guests. From our attentive catering professionals to our audio/visual team, you will be delighted in our service! Ensure your meeting or convention goes off without a hitch. Contact a professional meeting planner today to coordinate your upcoming meeting, banquet, or convention. The Hampton Inn & Suites is connected to the casino and offers 300 deluxe rooms including 90 king studio suites, free hot breakfast and free high-speed Internet. Gambling problem? Click here for help.